A Fan in….Valkenburg OR Where’s The Podium? One of those days when the expulsion of gas from the proverbial early bird has got nothing on me! If you want to get down there from up here before that time then you need to get up seriously early, if you know what I mean. As the Kevin Bus was heading that way for the first European World Cup, I was ready to join in! So, I’m off to the station and who should I meet, but the guy who gave me a lift back after Ronse, on his way home from the night shift! Small world, eh? 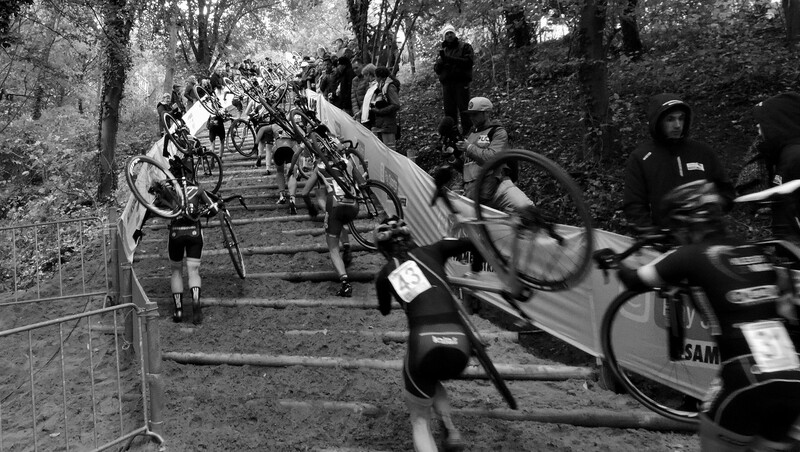 If you’ve read through last year’s AFI ( http://www.cxhairs.com/2015/10/23/afi-valkenburg/) you will note that I am not enamoured with this organization, but the grapevine tells me that the course has been changed so I have to go even if it’s just curiosity. At first I was a little excited as change can mean that it’s been a well thought out vision, taking all things into account for an athletic contest to be appreciated by all. But then I started to question. Then “where’s the podium?”, which was opposite the casino steps and was therefore good for us folk who want to see the ceremony to get a decent vantage. 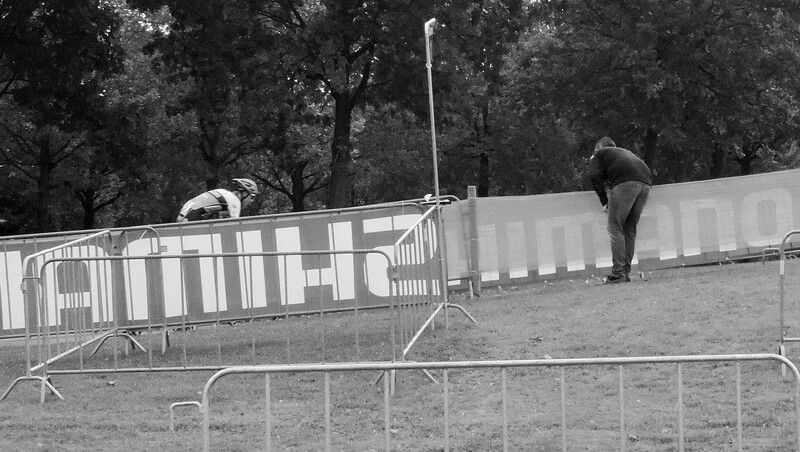 While you’re about it can you also tell me “Where’s the Start/Finish?” Nope, haven’t a clue. Moving on, I thought I’d go check out the stairs I’ve heard about. Yes, what was the scary-as drop-off is now a run-up (so many – in one sentence!). I have to say, it looks fantastic. They have placed wooden poles across the course in a rather beautiful curve, like something from those Disney Princess movies, and back-filled with sand in a very impressive staircase. And then you ask the question ‘Where do the people go?’ Answer: nowhere near the side of those steps! Which, was actually OK at that moment, as a couple of deer were caught there by the fence. No, I didn’t get a photo as I was just a little too concerned that one of them had got caught in the link fencing (thankfully, it was so OK that it ran off pretty damn fast!). Hopefully, by the time World Championships comes around in 2018 there will be somewhere for spectators here. Oh, yes, you did read that correctly. 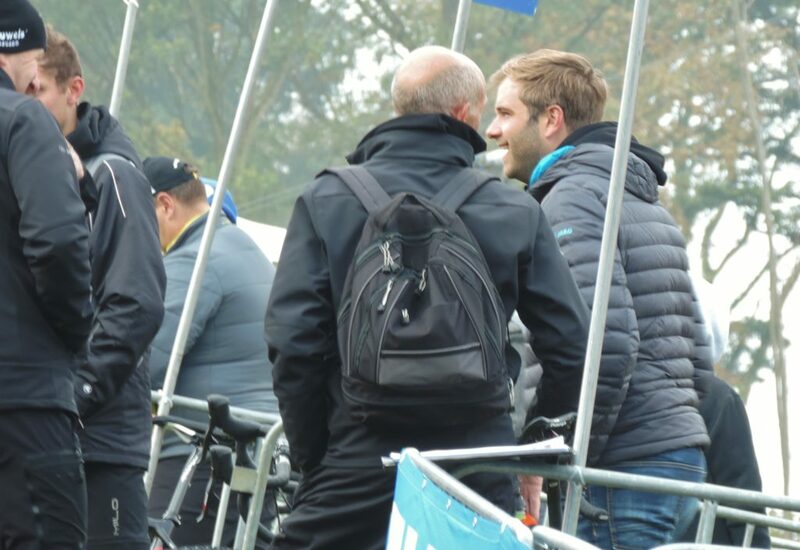 The UCI’s diversity policy in action – Netherlands, Czech Republic, Belgium, Luxembourg and then…Netherlands. As it’s a bit brisk this morning I head off to walk the course perimeter and the women are out practicing. 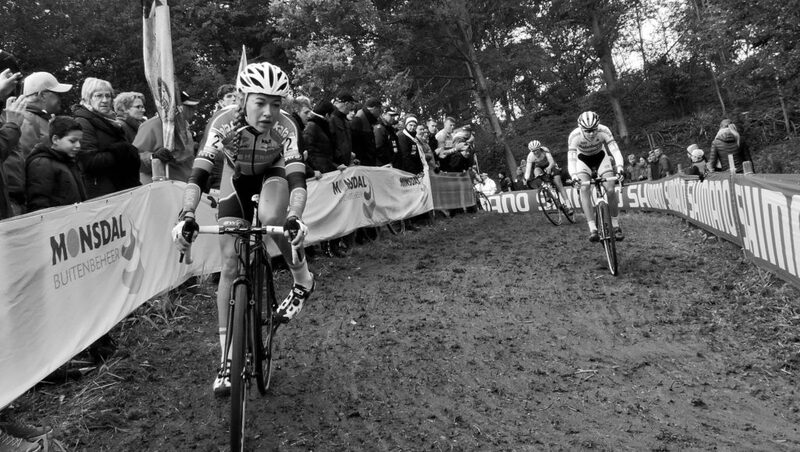 My first sighting today was Sanne Cant, for those keeping score. I meet up with some K-Pauw sups when I get to the big dip (there must be a better name for this. 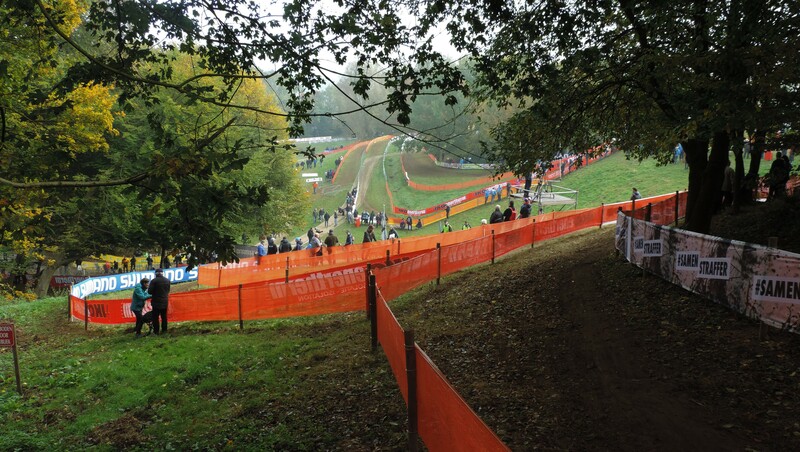 We have De Kuil at Zonhoven so maybe this could be The Hollow, of the Dutch equivalent). This part has changed too with the switchbacks no longer here and the whole bit from the bridge over by the Pits with the course coming from the pits, under the bridge & into the ‘arena-dip-bowl-hollow’ replaced. 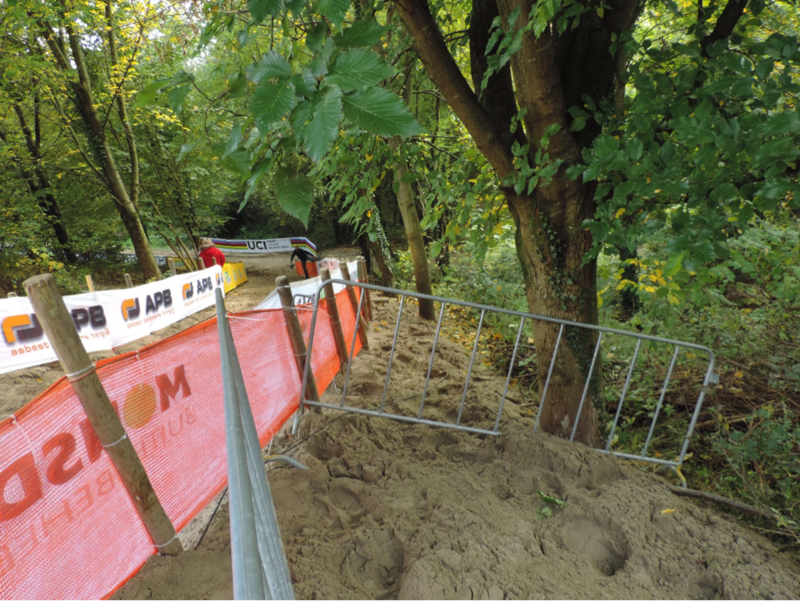 I think there is a new bridge in the woods, but we were not allowed on that part of the course so I cannot confirm it. 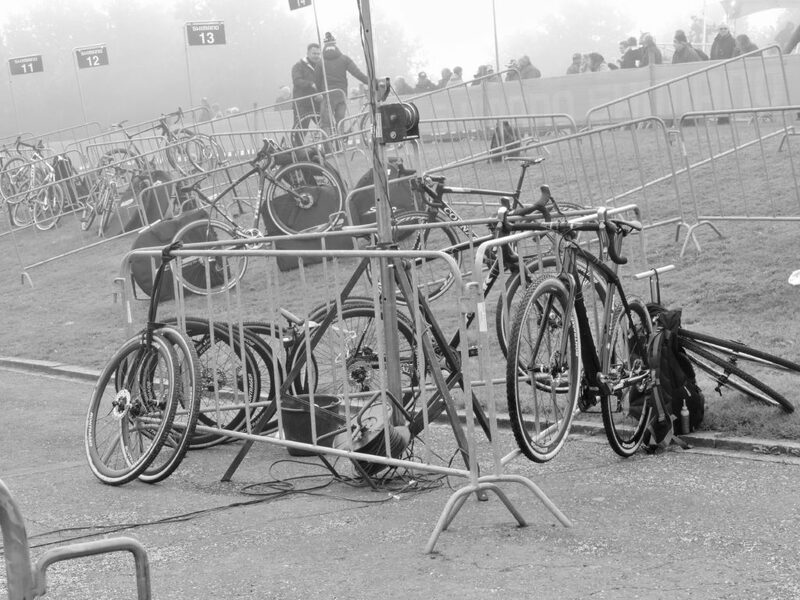 I guess the organisers were so engrossed with their changes that they hadn’t considered the spectators. A big screen down here would be good, guys FYI (and more than one portaloo, while you’re at it!) 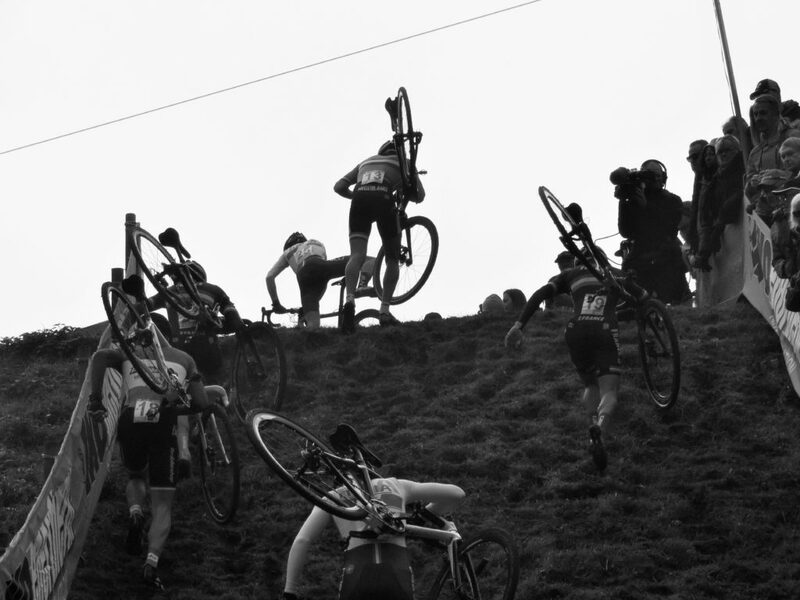 Especially with the new course, we had no idea where the riders were. Should we have the little map with dots on in the bottom left corner like on the driving video games? But the question on everyone’s lips today was – Where’s the podium? 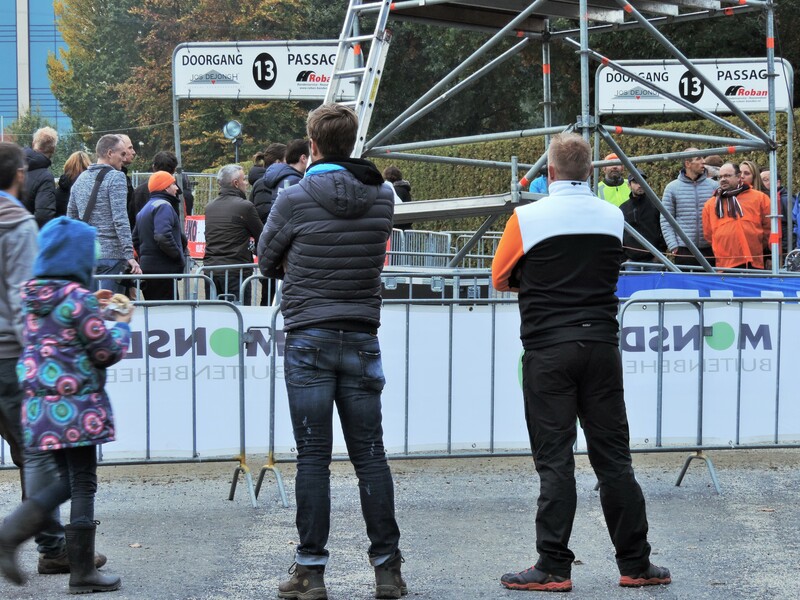 So now we wait for the U23’s to come into sight and from the announcer we know that Eli Iserbyt is going to have a fight on his hands from Gioele Bertolini, Quinten Hermans and Joris Nieuwenhuis. 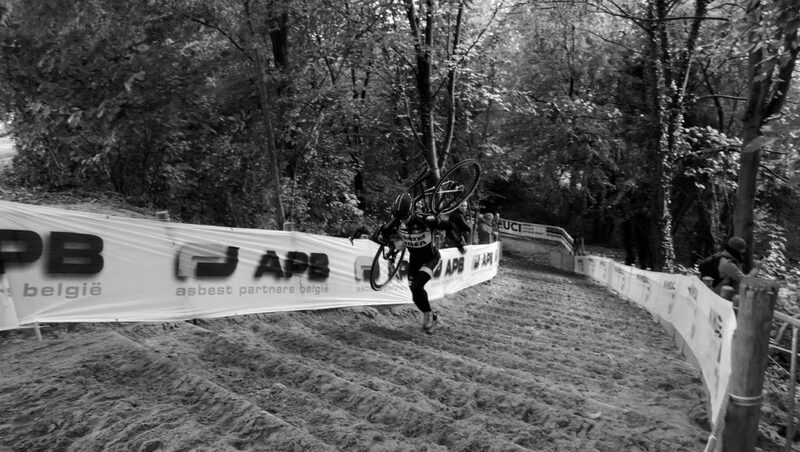 Sieben Wouters is also trying to get in the mix as is Yannick Peeters. It’s the Italian getting the better of it, as he did last year. This place really does seem to suit Bertolini. He must be looking forward to that World Champs with glee. 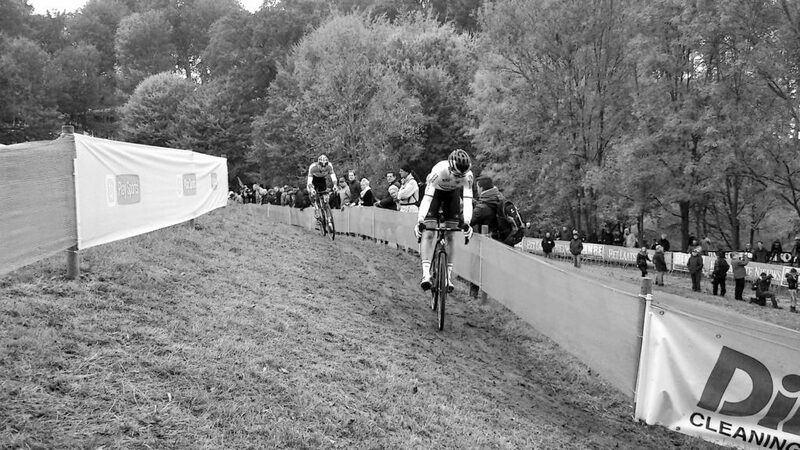 After spending a couple of laps in the ‘arena-dip-bowl-hollow’ being thankful that the organisers left the run-up alone (for now), I made my way up the hill to the pit exit and ran into Dirk, who I met last season as Mr CrossVegas guide/friend, who is Belgian, but merrily waving an Italian flag for Gioele Bertolini. Still hunting the podium, I make my way to the casino steps and find a volunteer to ask. I am told then to go out the way I came in, turn right and cross the car park you can’t miss it. Obviously, I did miss it as I was coming in though! Just wasn’t expecting it, I guess. So off I duly tramped; up the steps, out or the entrance waving my little wrist band, along the road, across the carpark and LO! The start/finish straight and podium! I stay to watch the U23’s take the lap with the other 10 people that had found it and then find my way in all other directions blocked except to turn around, go across the carpark, down the road, back through the entrance waving my little wristband and back down the casino stairs. Yeah, I’m not going to be taking any start, finish or podium photos today. The next question, of course, is, if the podium etc. is where the rider parking used to be, where is the rider parking now? I didn’t actually find the answer to this until we were driving home and went past them about 1km from the course in a field on the other side of the road (well, that was the elite men, who knows where the others had to go?). With all this running around my enthusiasm has taken a bit of a dent and I pretty much lost contact with what was happening in the race. Bertolini kept up his good record here with Joris Nieuwenhuis and Quinten Hermans filling the podium. Not a day for the World Champ. There was another big French presence in the race, but not the guys who were so impressive last year except Thomas Bonnet. So many good riders coming through there. I fully expect that they will have a rainbow contender in the near future. I got to watch the men practice the dismount and stair run. There was no sign of Bambi and his friend now though. How good is it to see Helen Wyman back in Europe? However, the Dutch women are making this race their own with Rainbow Thalita leading the charge and Sophie de Boer and Lucinda Brand joining in at the front with Sanne Cant, Ellen van Loy and Amanda Miller completing the front group. By the end of the first lap I had made my way over to the ‘arena-dip-bowl-hollow’ and now there is a chasing group of Alice Arzuffi, Kaitlin Antonneau and Helen Wyman battling it out with Pavla Havlikova, Caroline Mani and Maud Kaptheijns losing touch a bit. Ellen dropped off the pace of the front group first and Amanda stuck with them for as long as possible, but Thalita and Sophie put the hammer down and only Sanne could follow. Caroline came through to the chase group and Alice dropped back a bit. At the front Thalita took charge and Sophie and Sanne were having their own battle but Lucinda was still in touch with them. One mistake and this race could go any way. No falls or dropped chains here though and the strength of TdJ held to the end with SdB and SC filling the podium. With Thalita, Sophie and Lucinda the Netherlands also had Maud Kaptheijns in 11th and Annemarie Worst in 12th. Great day for the USA too with Amanda Miller in 5th, Kaitlin Antonneau 8th, Elle Anderson 13th and Rebecca Fahringer rounding out the top 15 (I think that’s still worth a Mars bar!). So, now, where to be for the Men’s Race? For the nimble and fleet of foot there is a part of this course which is great (I guess they’ll soon put a stop to that!) where you can go from the Pits to the flat course to the off-camber section and back all in one lap. Be assured Niels, Sven and Bart are doing it too! Plus, if you have good eyes and are a little taller than me (just about everyone!) you can also see the big screen. Lars van der Haar has made this course his own private playground in recent years and he seemed determined that this year would follow in the same vein. 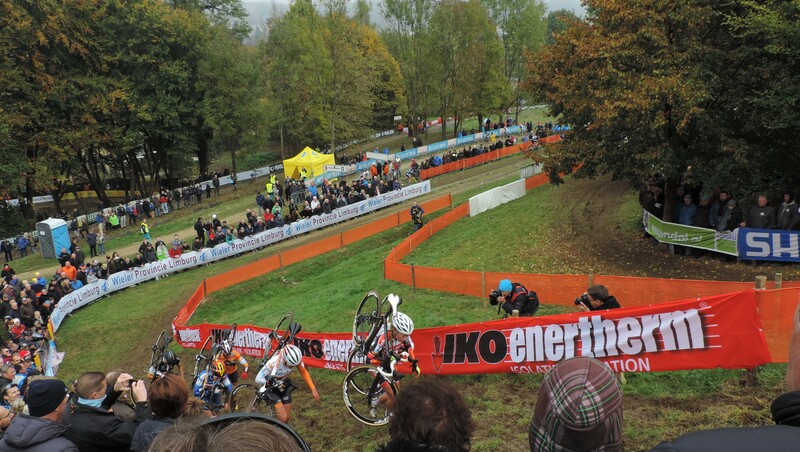 The CX gods had different ideas though and obviously felt that it had been awhile since he had fall (well, they did give him a pass at Zonhoven) so duly they pulled his wheels out from under him and his chances went with them. 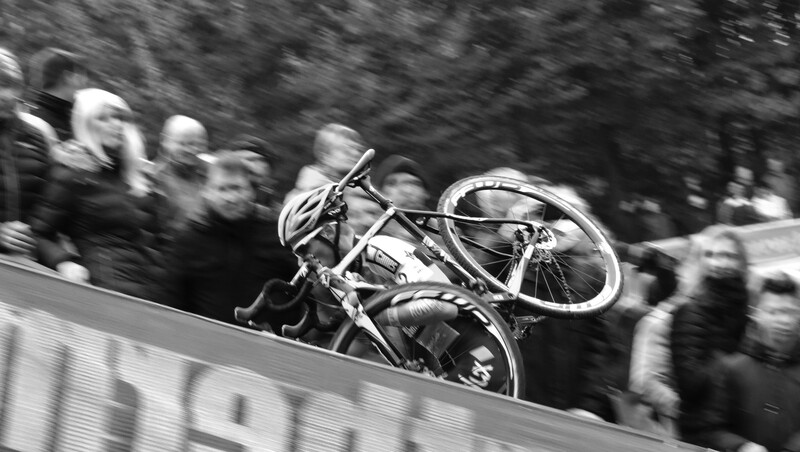 Now we were left with wondering what antics Mathieu van der Poel and Wout van Aert could come up with today. 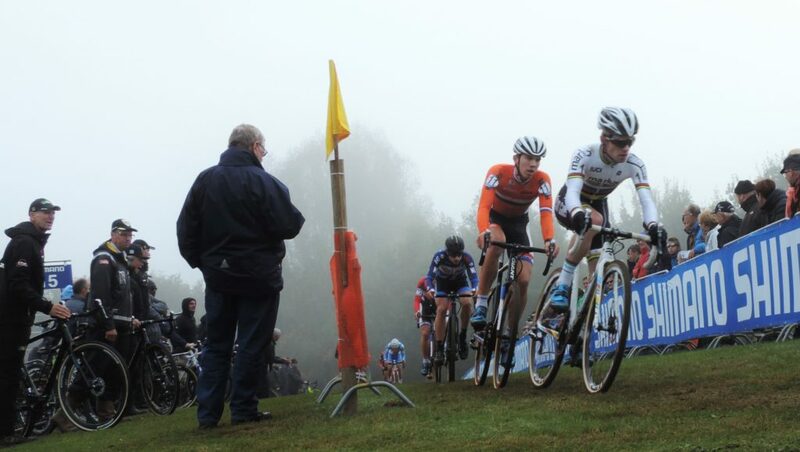 Firstly, it was Mathieu pulling away, for another Dutch win on home soil, from the front group with Wout, Tom, Michael and Kevin (much cheering). As Wout’s chain wasn’t playing up today he felt he had to do something different so got himself caught in the side barriers and took Tom with him leaving Michael in a clear second place and Kevin, who was happily sitting on the back of the group, now is in 3rd (Happy Dance). 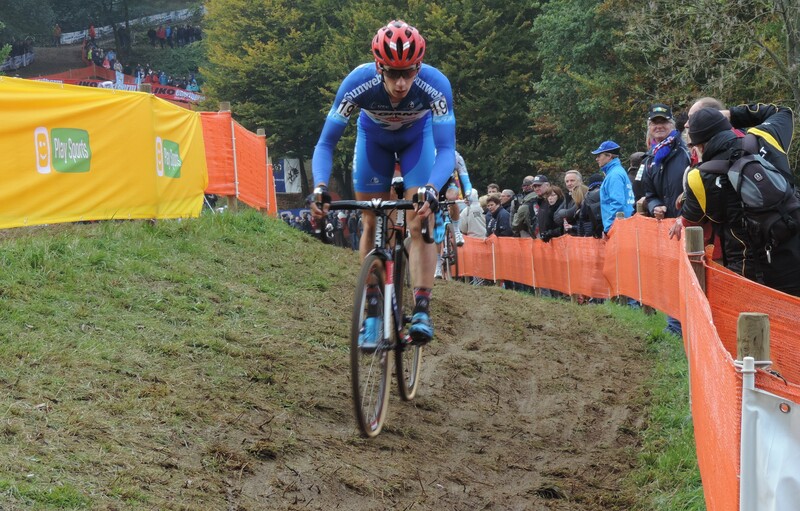 It wasn’t long before Wout sorted himself out and got that 3rd spot back L . but we thought Michael had a big enough lead there was no way Wout could get there…or could he? Yep, Wout is a freak (in the best possible way) and managed on that last lap to not only get back to Michael, but to take back that second spot. Kevin and Tom had their own battle for 4th place and when Tom got the better of it you can be Jurgen had plenty to say! Sadly, no podium time for the K-Pauw sups so we head off back to the bus. The one good thing about this course is that the supporters bus parking is right by the finish line (for now) so at least we don’t have to walk 3km back. It seems that we don’t need too much to make us happy and although in the end Kevin finish 5th we had a glimmer there for a couple of laps and that was good enough to play the CD! The general feeling was that the new course was not so great. After last year, I asked myself if I would come back here and of course I said yes and I will probably come back for the World Cup next year too, but I don’t have to be happy about it, do I? I feel I ought to apologize if this is a bit downbeat write up, but that’s just how I feel. If you saw it on TV and thought it was great then OK, but the only way I’m going to like this course is if Kevin wins. Sorry. On the plus side, we did get back to the bus dropoff just in time for the Antwerp train. Next up though, we are heading west to Oudenaarde and the Happy Hill of the Koppenberg. 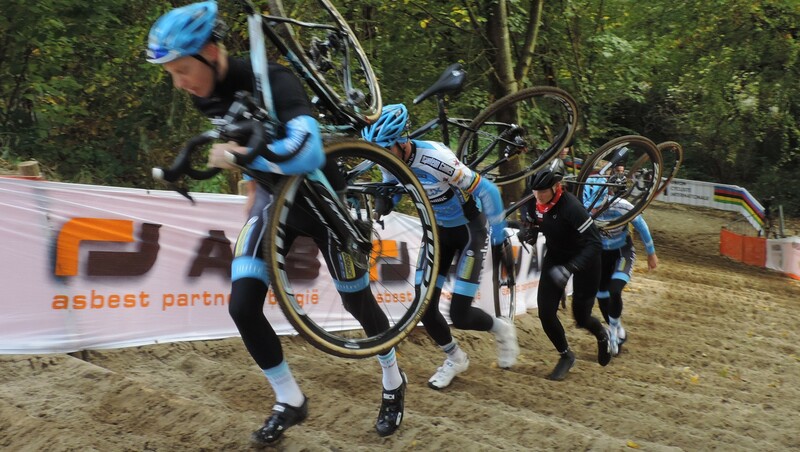 A good friend pointed out a technique clear in these pics…riders’ position is standing on the pedals instead of placing their weight back in the saddle when approaching a decend or turn…anyone care to elaborate on this technique?